If I could be friends with any famous person, it would be Joanna Gaines. Now, how would I convince her to help me redo and decorate my house, I’m not sure. I spend hours on Pinterest pinning beautiful homes that I will never step foot in. Come on, you know that you do it, too. Suddenly you look up and realize you’ve spent an entire Fixer Upper episode worth of time pinning away. When I was younger, I’d watch house shows with my parents (especially Trading Spaces and This Old House). As I have gotten older, HGTV has made me feel like I could actually fix up my own house with a little bit of hard work. 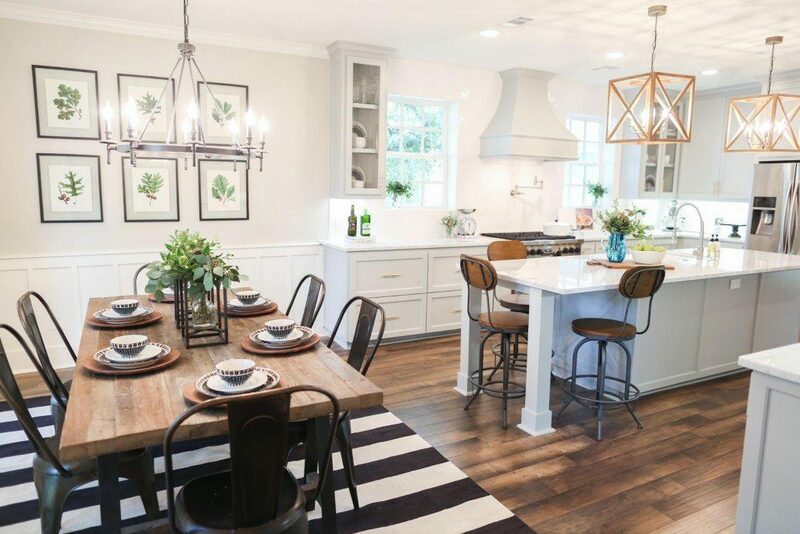 When we first moved into our own fixer-upper, we were eager to make it our own. 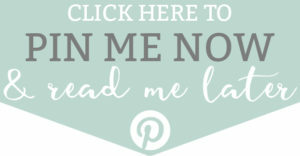 I had my Pinterest boards ready with ideas to implement in our new home (I just had to get my husband on board with my crazy ideas). With the help of our parents, we were able to turn our fixer-upper into a much more inviting space. 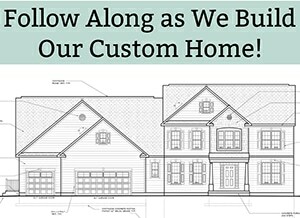 We still have a few projects left to complete (which I hope to show you on the blog). 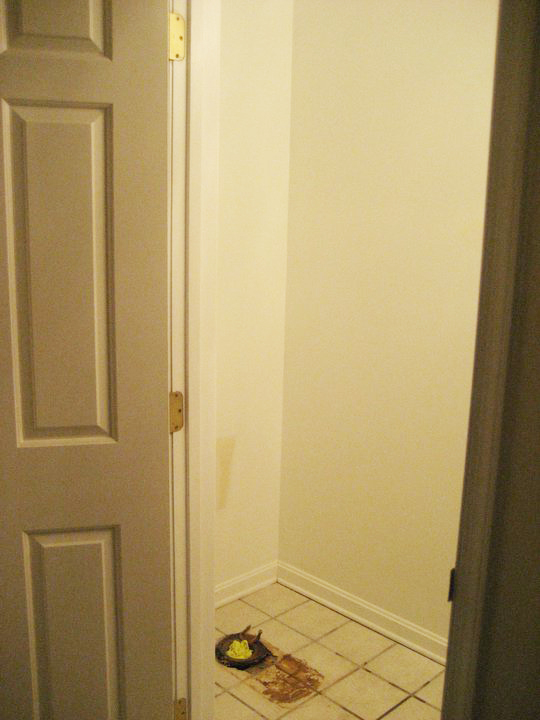 One small project we completed was updating our powder room. 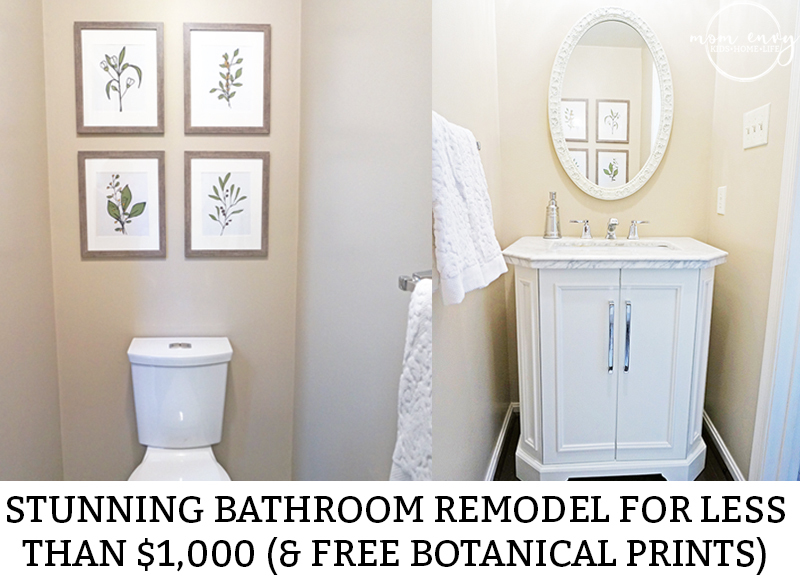 We were able to finish an inexpensive bathroom remodel for just under $1,000. That’s right – everything including the floor cost us just $1,000. 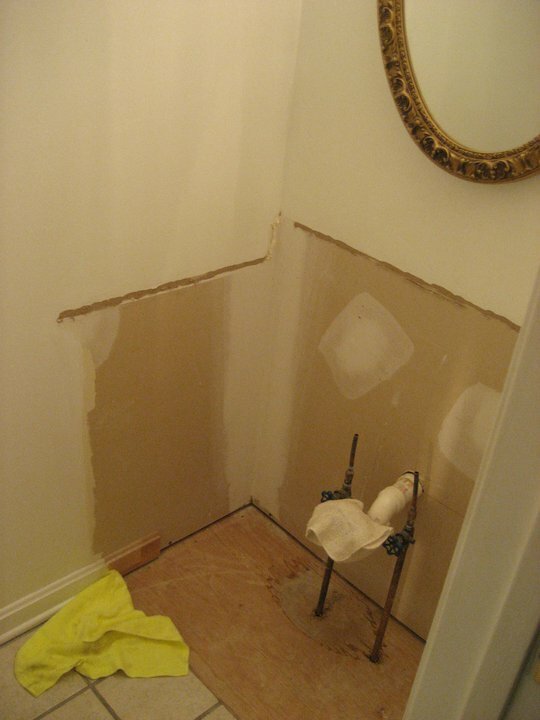 This is our bathroom after the toilet was removed. Oh so gross. When we moved in, almost our entire house was still in it’s original 1980’s form. 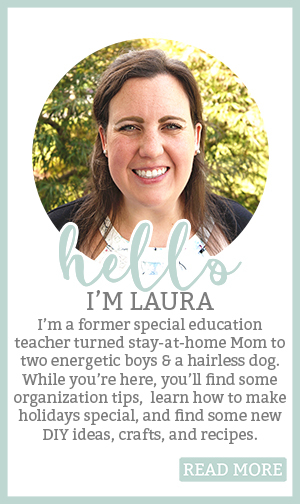 From white tile to cherry cabinetry, to barely functional toilets – we were moving into a home straight from my childhood. This is a smaller version of the vanity we pulled out of the other bathroom (this one is located in our playroom bath. Yes, it still looks like this (see – more projects left). 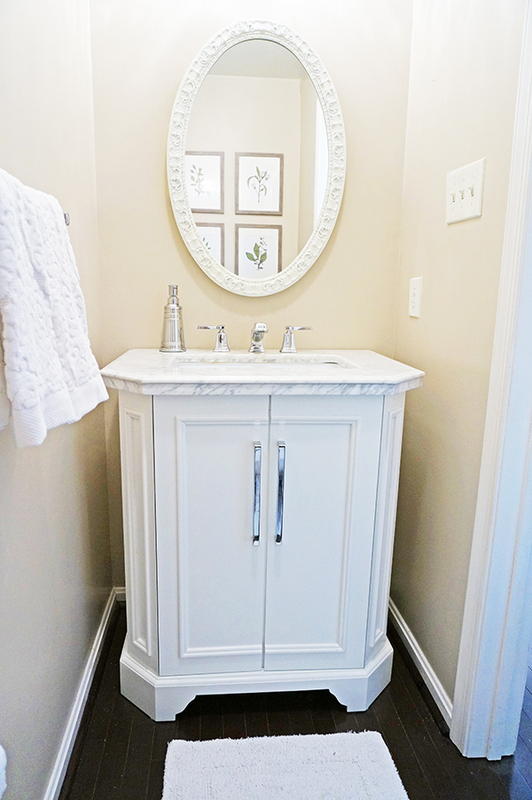 The powder room had a cherry cabinet with a basic off-white colored top. A brassy-looking mirror hung above it, and there were two matching lights. The toilet and the 80’s white tile floor finished the look. This is what our vanity area looked like after my husband & Dad gutted it. The nice thing about fixing up a powder room is you can make a major impact with just a little bit of work. If you’re interested in doing renovation projects, it’s a great place to start. My husband and I are learning to be handy. My parents, on the other hand, should have started a blog about their home improvement skills years ago. They’re amazing. When we moved in, we replaced all of the flooring in the house. We used dark hardwood floors throughout most of the first floor. Two kids and one hairless dog later, I wish we would have installed laminate or vinyl flooring. Flooring for a half-bath isn’t expensive because the square footage is so small. While my husband is great at tiling, the cost to run the hardwoods in the half-bath was so inexpensive, we decided to go with that instead for a continuous look. Paint was another way we were able to keep costs down. Painting the builder-grade off-white a beautiful bungalow beige (from Sherwin-Williams) transformed the space. It’s simple and traditional which means I can change out the hand towels and art as time goes on without having to repaint. To save more money, we kept the original light fixtures and mirror. My Mom, master spray-painter extraordinaire, painted them for me (I was pregnant at the time). The mirror is one of those items that was well worth saving. You see, the mirror has a little secret. Believe it or not, it’s a medicine cabinet. It’s my favorite thing in the room. If the bones of your light, cabinet, or mirror are in good shape but just need some sprucing up, try some paint for an easy, and cheap fix. It really will save you money in the end. 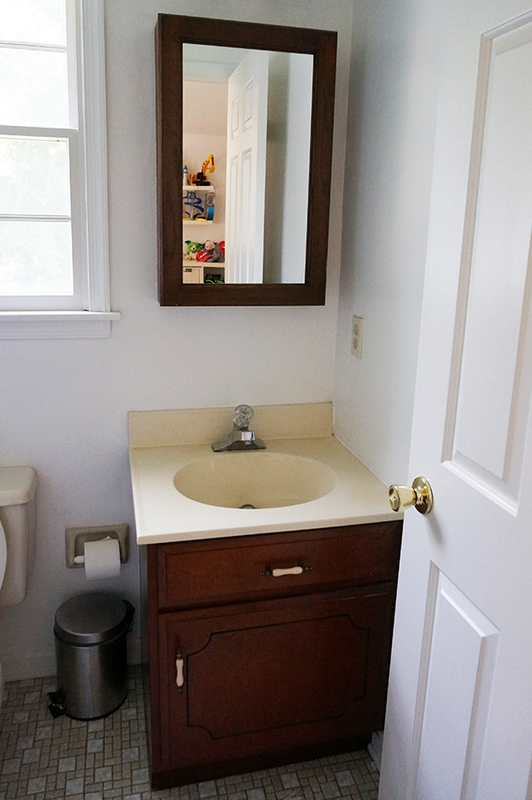 Next, we debated replacing or updating the vanity. We thought about painting the cabinet and just replacing the top to save money. Then, while shopping during a bath sale at Lowe’s, we scored a beautiful white vanity with a carrara marble top for only $350. It was a steal and well-worth paying a little extra instead of painting. They now sell this newer version that comes with a mirror (it will go on sale if you have the time to wait, just recently it was on sale for $399 and if it would have fit in another bathroom in the house, we would have grabbed one). During the sale, we also snagged a faucet, new towel bar and toilet paper holder. 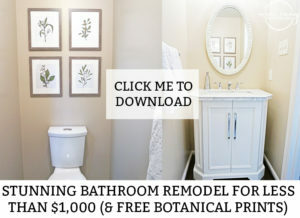 If you’re going to do a bathroom remodel, it really is worth waiting for a bathroom sale. It allowed us to save hundreds of dollars. Next, I recently replaced our hand towels with these from Target. (Again, I got them on sale!) Our other ones had seen better days and for just a small amount of money, I was able to keep our bathroom looking nice. 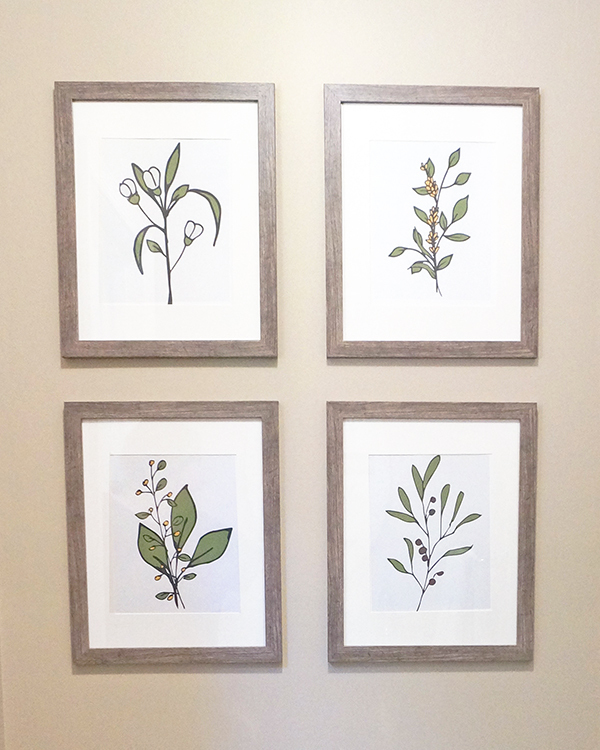 When it came to decor, I decided to go with some simple art on the walls. While I love the look of decorated shelves, I knew I could save some money by creating art myself. I was recently inspired by some Fixer Upper spaces and some pieces I saw in Pottery Barn. 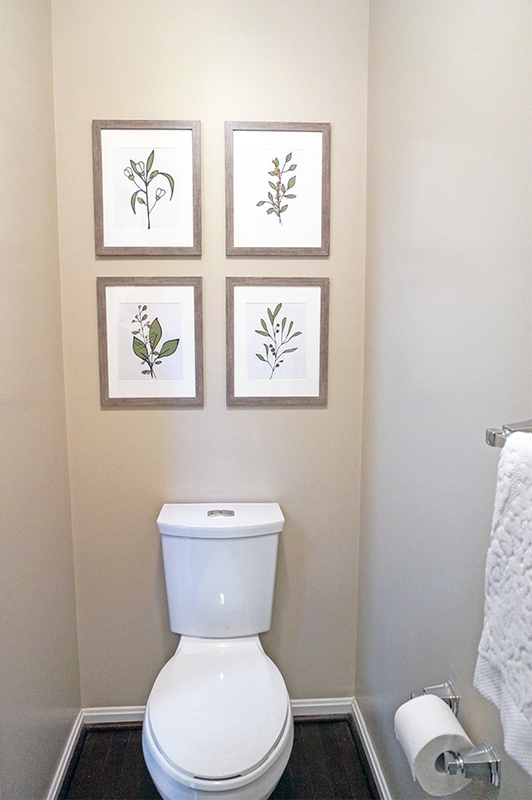 With so many other remodeling expenses, I just couldn’t bring myself to spend that kind of money on artwork for a bathroom when I knew I could replicate a similar idea myself. 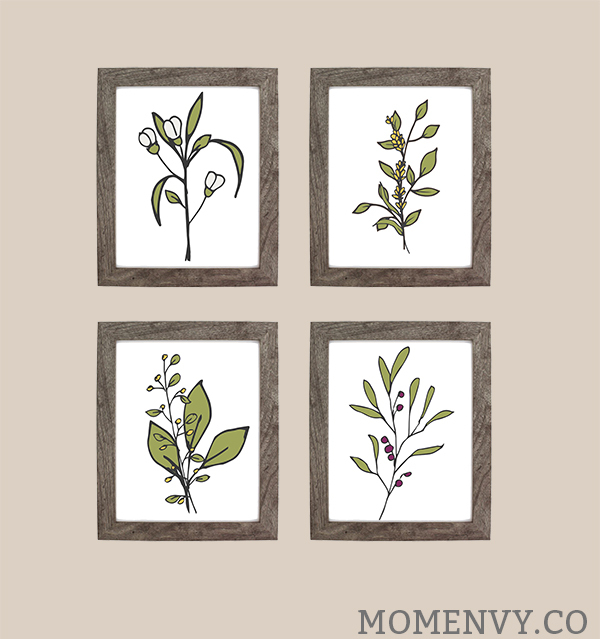 Magnolia, Joanna Gaines (from Fixer Upper Episode 9). I used images designed by Freepik.com to create the prints (my favorite clip art site). 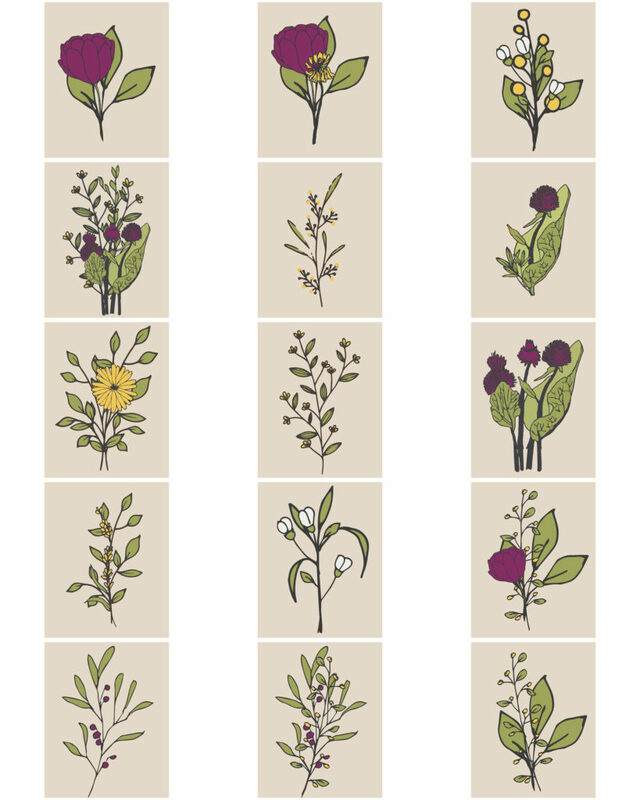 I found hand-sketched flowers that I filled with various colors and layered to create a variety of looks. I placed the flowers on both a white and beige background. After I was done making 15 prints, I used Photoshop to place four images together until I got a set that I loved (there were so many other great options, but this is what I settled on). 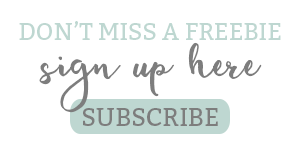 Now, I am going to give you a little secret to making free printables look expensive. You see, at first, I bought 8 x 10 frames for my prints. But they looked too small and were just a little blah. I took back the frames and purchased four 11 x 14 frames with a mat (they were only $8 a piece). I used the same 8 x 10 prints that I printed on my home printer. Adding the larger frame with the mat made a substantial difference in the look. I was lucky enough to get my frames on sale at Michaels. If you don’t have a Michael’s near you (or want to shop in your pajamas), you can get a similar frame from Amazon. So if you’ve been thinking about remodeling a bathroom, but have been worried about price, it can be done! I promise it’s possible to complete an inexpensive bathroom remodel. Just don’t forget, the key to saving money is to: paint items with good bones, do any work you can yourself, and look for sales! Do you have any fixer upper stories? I’d love to see! I always love Pin-worthy before and afters! Floral designs were colored/modified and mixed and matched. They were designed by Freepik.com, Freepik.com, and Freepik.com. Wow your bathroom turned out amazing! It is so bright, great color choice!! 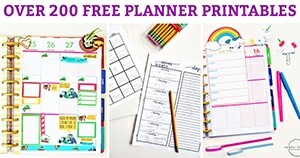 I also love your tip about how to make printables look more expensive. I hadn’t thought about using a mat, great tip!